With this option, the user name and password that you use for login to Windows will be used in Intrexx to log on to Exchange. The login data can either be queried session-based and must then be entered by the users every time they log on to the portal again, or you can enter the data in encrypted format on the MediaGateway in order to avoid needing to renew logins. In this case, a connection will be created by Intrexx between the logged-in Intrexx user and the saved login information for the Exchange server. The Intrexx portal must be run with integrated authentication. The users in your Active Directory must be correspondingly entered to Intrexx. Users can also be imported with ease. Please ensure that at least one user is contained in the Administrators group, so that you can continue to administrate the system. The server on which the MediaGateway is installed requires the group permission "Delegation". All clients and server must be members of the same domain. In Internet Explorer, the security settings for the zone to be used during user authentication must be set to "Automatic login with current user name and password". In addition, the checkbox "Activate Integrated Windows authentication"needs to be activated in the advanced settings. With the Kerberos authentication, you will have a true single-sign-on for access by your users to the Exchange server that will use the integrated Windows authentication. If a user cannot be authenticated, the session-based login will automatically be activated. The login of an Intrexx user to the Exchange server takes place via a login box that will be shown when an Intrexx Exchange application is called up in the portal. Please ask your system administrator for further information on this topic. 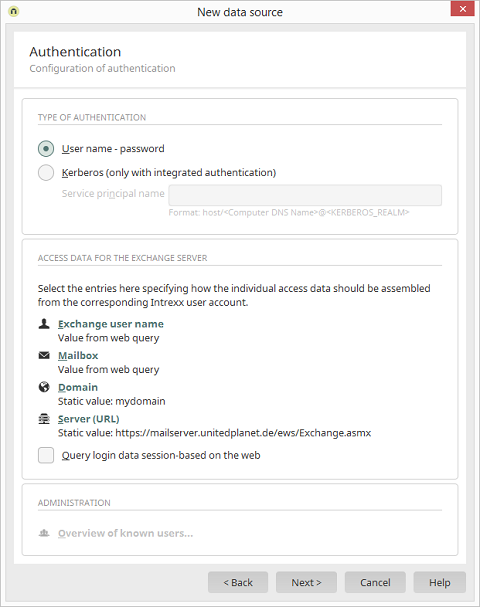 In the configuration of the access data for the Exchange server, you can define whether specific data should be automatically entered to the login box, like the domain, or if data should be taken from the User Manager, such as the user name, or which data must be manually entered by the user to the login box in Intrexx Exchange applications. In each case, opens a dialog where you can define the source for the user name, email address, domain and server URL for logging in to the Exchange server. If this setting is not activated, all login information from the login box will be saved as user account in the MediaGateway as soon as the user logs on for the first time with the Intrexx Exchange application. If this login was successful, the corresponding account information will be saved, encrypted with RSA, to the MediaGateway. The next time the Intrexx portal is visited, the login will not be required, as long as the connection to the Exchange server can be established. Next, the login box will then only be shown again when changes to the access data of the user come about, i.e. when, for example, the value of a relevant field in the User Manager has changed. If the setting is set for "Login data in web is session-based", the information will be queried for each session and no account will be created on the MediaGateway. The login box will thereafter always be shown the first time an Intrexx user opens an Exchange application in the portal. An Intrexx portal user can only access the information on the Exchange server for which they have been provided permission by the Exchange Server. Opens a dialog which contains a list of the users in the MediaGateway. This link is clickable if MediaGateway accounts have already been created because users have logged in.